Build an expertise in this essential area of Human Resources. Employee Relations (ER) issues require knowledge of policies and laws, a defined process for handling employee issues, and effective investigation and communication skills. The Advanced Employee Relations and Investigations Certificate equips participants with ways to identify preventative and proactive ER strategies in order to manage employee day-to-day issues and handle complex complaints. Develop and practice core HR skills. Explore the impact of effective ER on your organization’s success. Effective Employee Relations is a prerequisite for completing this certificate. Human Resources and the Law can be applied to this certificate if also completed for the Human Resource Management Certificate. Other workshops may only be applied toward this certificate. 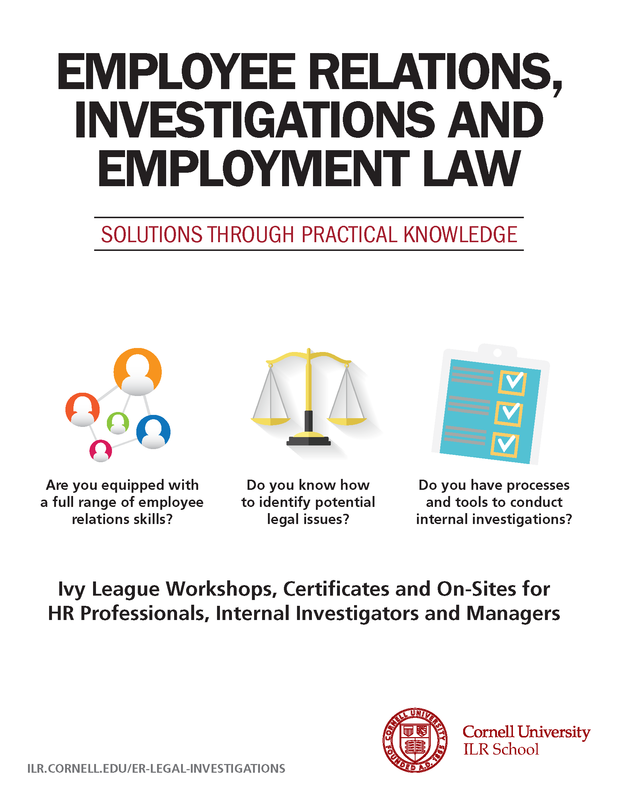 Gain insights on preventing, identifying and managing employee issues that have potential legal concerns. This comprehensive and interactive workshop includes up-to-date information on employment laws and cases defining employer-employee rights and obligations, and practical implications of laws in day-to-day HR operations (e.g., discrimination, compensation and benefits). Current legal issues are highlighted, including a module on social media and privacy. For EEO/HR professionals and managers, prevention is the key to maintaining a productive workplace and avoiding illegal harassment on the job (sexual, racial, religious, ethnic, age, disability, etc.). This interactive workshop examines legal and policy concerns, and best practices for facilitating respect and dignity in the workplace. Conflict may have constructive or destructive consequences on individual or team performance. Acquire the ability to identify, confront, manage and resolve conflict. Emotional Intelligence (EI) is the ability to harness emotions in sensing, understanding and responding adeptly to social cues in the surrounding environment. It has grown to be a better predictor of success than IQ. Measure your current EI level and receive coaching to improve it. Then learn to use your EI to interact with others, solve problems and achieve higher performance. View a detailed list of upcoming Employee Relations workshops.